In April of 1968 my dad, Deane Gunderson, gave a speech to his “fellow Republicans” at Iowa’s state Republican convention. He gave the speech in hopes of being selected to be a delegate to the G.O.P.’s national convention held in August of 1968. 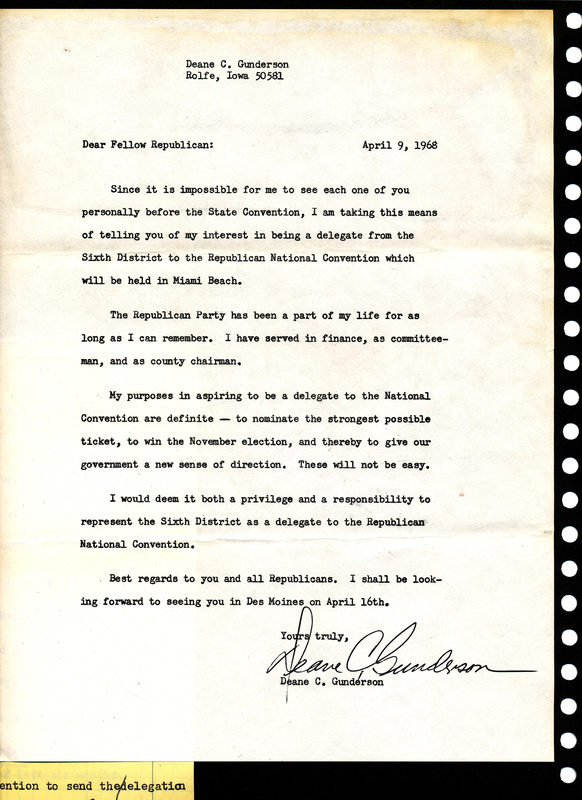 Prior to giving his April ’68 speech, he sent a letter to those “fellow Republicans” letting them know of his interest in becoming a delegate to the national convention. That letter is included below. It is from a page of a scrapbook my mom made for my dad’s 80th birthday. I’ll post my dad’s speech later this week. In the most recent post I included a newspaper clipping giving the names of the Iowa delegates and alternate delegates to the 1968 G.O.P. National Convention. This entry was posted on August 28, 2012 at 9:01 am and is filed under Uncategorized. You can follow any responses to this entry through the RSS 2.0 feed. You can skip to the end and leave a response. Pinging is currently not allowed. I had never seen this letter, and found it very interesting to see in writing Daddy’s commitment and purpose. He and I used to talk on the phone most Sundays, and often the conversation would encompass politics. Yes, it’s too bad he’s no longer available to ask about his thoughts on current politics, but I have a feeling those viewpoints he had are equally as applicable to today as back then.